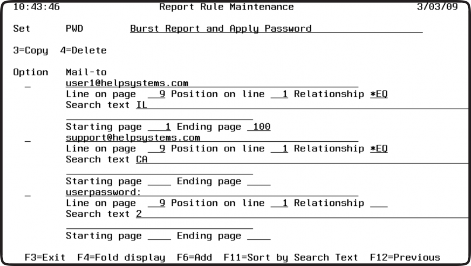 Recipient-specific passwords can be applied to each section of a bursted report when sending as a PDF. 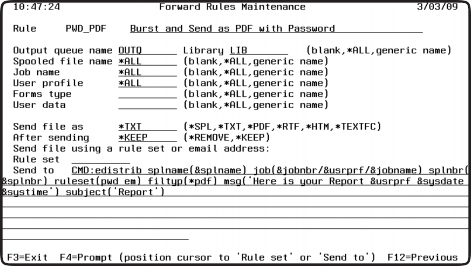 Using Esend’s Report Distribution feature, the special Mail-to keywords USERPASSWORD and OWNERPASSWORD will use a value on the spooled file, defined by line and position, as the password for each resulting PDF file. Something known by the recipient, like a social security number, is a good example. The report sample below generates a list of customers by state. The report will page break on each unique state value (such as CA, or IL). 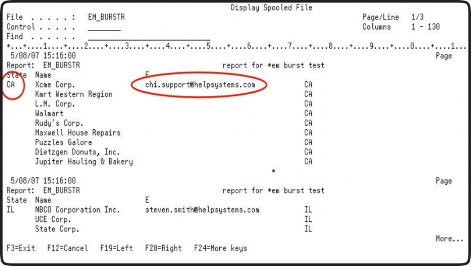 The report generates a different e-mail address for each section. Both the rules that follow use a special Mail-to value—USERPASSWORD (required to open) and/or OWNERPASSWORD (required to modify). Line and Starting positions are specified for a value on the page that will be used as a password (such as SSN). Both rule examples use the state value as a pass- word for each section. This Esend distribution rule (ERPTRULES) searches the spooled file for the different state value and e-mails the results to two different addresses. The state value is used as a password for each section. The value of ‘2’ for the Search Text indicates the number of positions for the password. If no length is specified, the password value is assumed to end at the first blank encountered. 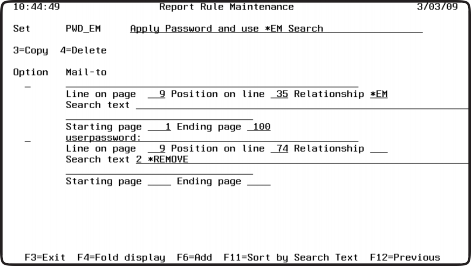 This rule uses the *EM relationship to burst the spooled file and send results to the e-mail addresses found in the spooled file. Each file is protected with a recipient-specific password (state value). You can add *REMOVE to the Search Text value, which removes the password value from the resulting PDF file. You must include the length value when you use *REMOVE. Either of the Edistrib rules above can be used in an Esend forwarding rule (EFWDRULES). Again, the resulting output is a PDF file. Note: The Password parameter is NOT specified in the EDISTRIB command. It is added by the edistrib rule—PWD_EM.